I always feel a little apprehensive when I get a call to rescue a cat that no one knows, and there are two reasons for that. 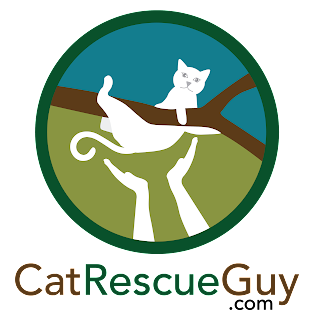 First, I am unable to gather any information about the cat before the rescue to predict his reaction and to plan how to approach him. Secondly, there is the problem of what to do with him once I bring him down. If no one there is able to take responsibility for the cat, it falls on me to decide his fate. 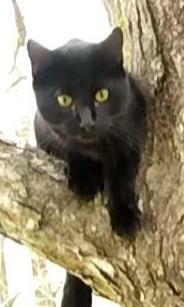 So when John called me to rescue an unknown black cat in his back yard, I felt apprehensive. When I arrived at the site and saw the cat, I immediately felt much better. 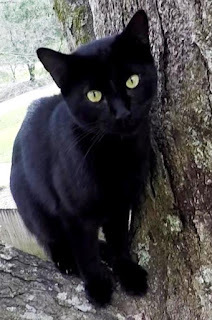 There I found a small, solid black cat, probably less than a year old, 20 feet high in a tree, looking at us and crying for help. A feral cat would not be crying like that, so I felt relieved that at least the probability of a friendly, cooperative cat was fairly high. 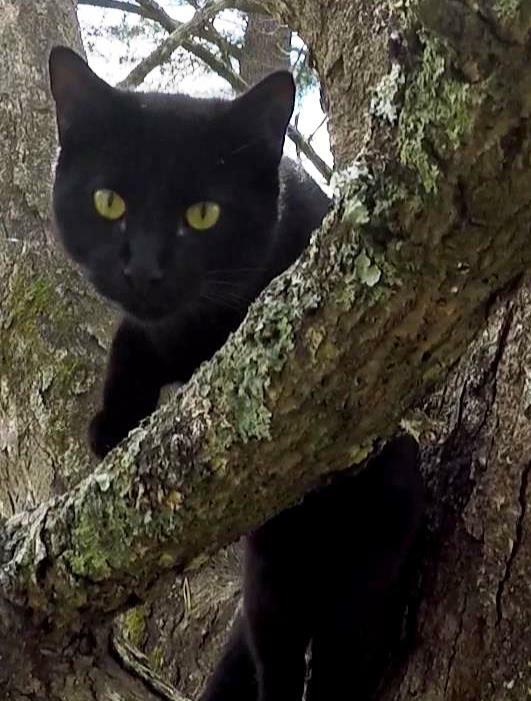 The cat watched my preparations as I installed the rope in the tree well above him, and he was not bothered by it at all. That was a very good sign. He continued to call for me as I climbed up toward him, and I was feeling better and better about this rescue with each second. When I reached level with him, he was perfectly comfortable with me and let me touch him. He even appeared to try to step down into my lap at one point. Yep, this little guy was going to be an easy rescue. He seemed so anxious to go down, that I thought he might step into the carrier even without any food to entice him inside. When I presented the carrier to him, however, he just sniffed it and would not go in. I opened a can of food, and that got his interest right away. He did not hesitate to eat a couple of bites, and then I put the food in the back of the carrier. When I put the carrier up to him, he hesitated a little to go inside. He was interested enough to step inside, but then he backed out. I gave him another chance, and this time he went all the way inside and began eating. After tucking his tail inside, I closed the door and brought him down. After packing up my gear, we took the cat to John's screen porch and released him. I wanted to scan him for a microchip, and I needed to be able to put the scanner close to him. He was very comfortable as I picked him up and held him, and now I could see that he was an intact male. I scanned him thoroughly but did not find a microchip. I visited with him on the floor there for a few minutes while I decided his fate. Since he was not neutered, I decided it would be best to take him to Companion Animal Alliance (CAA), our local animal shelter, where he would likely be neutered, vaccinated and returned to the same location. Hopefully, if he belongs to anyone nearby, he will find his way home and the owner would gain the benefit of a free surgery and vaccination. John asked all the neighbors about the cat and learned that he has been making the rounds to several neighbors for quite a while. They all have been enjoying seeing this friendly boy come around. I posted a notice on the local Lost Pets Facebook page, but as of this writing, no one has come forward to claim him. I also brought him to the attention of Cat Haven to see if they would put him up for adoption. I will update this page when I learn anything new about his status.